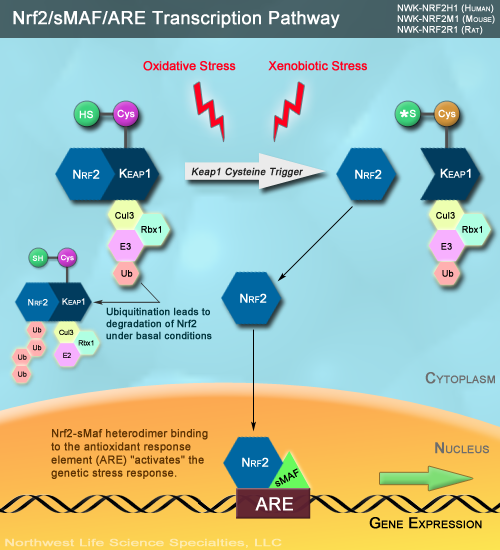 Since its initial discovery and characterization more than two decades ago, nuclear factor (erythroid-derived 2) like protein (NFE2L2 or Nrf2) has quickly risen to the forefront of investigations involving redox homeostasis. In the last 5 years, publications have increased nearly 25% annually - and this year alone Nrf2 related research is on pace to increase by 40%. Many of these studies have already associated increased Nrf2 nuclear translocation with amelioration of disease and species longevity, while others have clearly identified Nrf2 as a key factor in tumor viability and resistance to chemotherapy. Recognizing the large amount of work being done in this exciting area, we are pleased to make available several species-specific assays for quantification of Nrf2 and KEAP1 levels. We hope these kits underscore our continued commitment in providing the most relevant tools for investigating Oxidation, Inflammation and Regulation in Redox Biology. As always if you have any questions or comments, we'd love to hear from you.